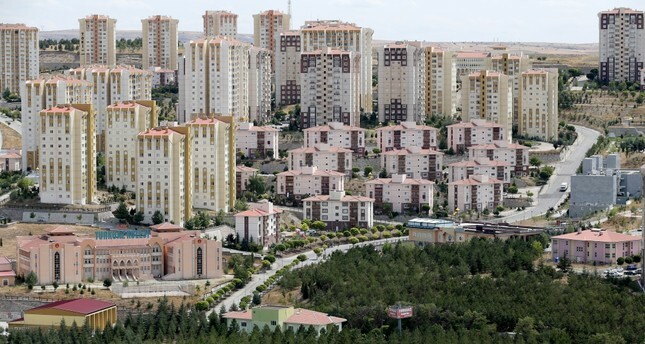 Environment and Urbanization Minister Murat Kurum unveiled Wednesday the details of a new discount campaign in the real estate sector, which was praised by sector representatives who said it will create momentum and boost housing sales. Speaking at a press conference, Kurum said buyers would get a 10 percent discount on house prices and that down payments would be reduced to 10 percent, instead of 20 percent, within the scope of a two-month campaign launched with an interest rate set at 0.98 percent. The campaign will start as of today and last until Oct. 31. Kurum said if citizens assess their investments in gold or foreign currency, the price of an apartment will be reduced in accordance with the increase in gold and foreign exchange in the following process, stressing that there is no need for anyone to put their gold and foreign currency aside in this regard. Kurum said the real estate sector has always fulfilled its responsibilities under Turkey's economic conditions, adding this is a campaign of sacrifice. "You know that our country is facing an economic siege. We are a strong country. No matter how tough the circumstances are, our country continues to grow. In response to President Recep Tayyip Erdoğan's call, millions of our citizens have taken a national stance by cashing in foreign currencies. I thank all of our citizens for their support," Kurum said. "There is also a 15 percent interim payment in the 12th and 24th months. For the remaining 120-month amount, our contractors and administrators will credit in-house without a bank or guarantor for the 60 percent portion with a monthly delay interest of 0.98 percent, which corresponds to about 84 percent maturity regarding the total amount of the apartment. So, given the fact that interest rates are 2 percent today, there is a huge sacrifice," Kurum added. He said that it is advantageous for those who want to close the debt within 6 months or 1 year, adding the absence of the bank and the bailout is a sacrifice made by the contractors and the industry. "I think that real estate is always appreciated in our country and that with this sacrifice, it is impossible for the citizens not to benefit, so it is a very important campaign in terms of economic value, sector value and the profit of the buyers," Kurum continued. "We are running a fast establishment process where we will not use American products but establish the Real Estate Bank, carry out projects for the imported goods to contribute in the domestic production and ensure that imported products are produced here to support the activities related to the sector and real estate with the Real Estate Bank. We have moved quickly to establish this in a short period and to be a bank that will benefit both our citizens and the sector. I hope we will complete this process by the end of the year." On a question regarding the regulation of foreign residential sales, Kurum said the details of the ongoing project will be explained by the relevant ministries in the future, underlining that the relevant ministries are working to accelerate the service while also following the process as a sector. Many companies will be involved in the initiative with numerous projects. Emlak Konut Real Estate Investment Company, Turkey's biggest real estate investment company, will also participate in the campaign with 12 independent sections in 33 projects. Nazmi Durbakayım, the chairman of Istanbul Construction Companies Association (İNDER), said that the campaign will create a stir in the construction sector. Suggesting that this campaign will overcome the recession in the sector, Durbakayım said the construction sector will continue to operate in a healthy and strong manner. Housing Developers Association Chairman Altan Elmas said that they acknowledge the leading role of the real estate sector and intend to overcome the speculative attack carried out on exchange rates and interest with this campaign. Feyzullah Yetgin, the chairman of Real Estate and Real Estate Investment Trusts Association (GYODER), said the campaign will create a great momentum in the sector. He also noted that the industry has been able to display a very flexible management style in recent years thanks to the knowledge and experience it has gained over the past few years. Pointing out that all sectors are affected by fluctuations in exchange rates, Yetgin said, "As representatives of the real estate sector, despite the effects of the recent exchange rate hike, we will increase the added value of our economy by working and producing more with the awareness of responsibility toward our country."